The ultimate skin care, who does not want that? At Son & Park you are at the right address for this. Son & Park has turned the world of beauty products on its head! You understand that you can not let this run, of course. This award-winning K-Beauty brand should absolutely not be missing from your stash! The founders of the K-Beauty brand Son & Park are two famous make-up artists who are known for increasing the popularity of the dewy look make-up look in Korea. Art is the heart of the brand, the line is known for the good quality with simplicity clearly reflected in the products. Son & Park was the proud winner of the People's Choice Beauty Award in 2015! 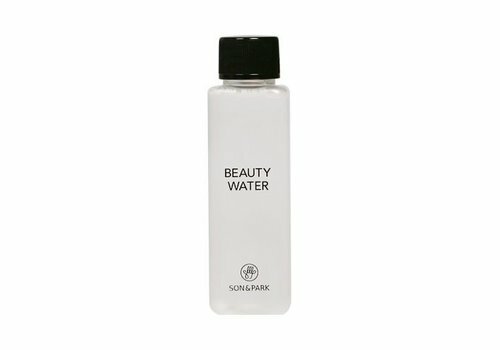 The Son & Park Beauty Water is the holy grail in the world of facial cleansing. Nothing really works as well as this bizarre good cleanser and multifunctional toner in one! Active ingredients such as coconut, corn, potato and wheat extracts give you extremely cleansed skin, while papaya extracts and willow provide exfoliation of the skin. Is that all? No! In addition, the Beauty Water hydrates your skin intensely through the rose water, lavender water and orange extracts. Need to say more? You really need this Son & Park product! Want to buy Son & Park? Order now at Boozyshop! What else do we need to say to convince you that Son & Park is really made for you? We know you want this! Lucky you, because you can order Son & Park at Boozyshop now! You can very quickly enjoy the award-winning K-Beauty brand, because if you order before 20:00 on workdays, you'll have it the next day! Do you order for more than € 30? Then you get a free gift. How nice is that! Hurry hurry babe, then you have your Son & Park products as soon as possible!